BMW had been driving excitement about its new vehicle for weeks. The Bavarian manufacturer has finally put an end to the suspense by unveiling its iNEXT Vision concept. This model will inspire the first iNEXT in 2021, which will create a new family of vehicles with a purely electric motor. With its new range, BMW wishes to accelerate the democratization of electric and autonomous vehicles. Until now, little was known about the iNEXT Vision. BMW was content broadcasting just a few brief images showing the car. Fortunately, the German car manufacturer put an end to this wait by lifting the curtain on its model. BMW went for a grand style presentation with this, making the car official on board a Boeing 777F from Lufthansa. The partnership was rather surprising, given the juxtaposition between a plane that pumps out CO2 and a “zero emissions” car. More than a vehicle, the iNEXT Vision is a real showcase for the automotive brand. It is also a taste of what awaits us on our roads in the coming years. 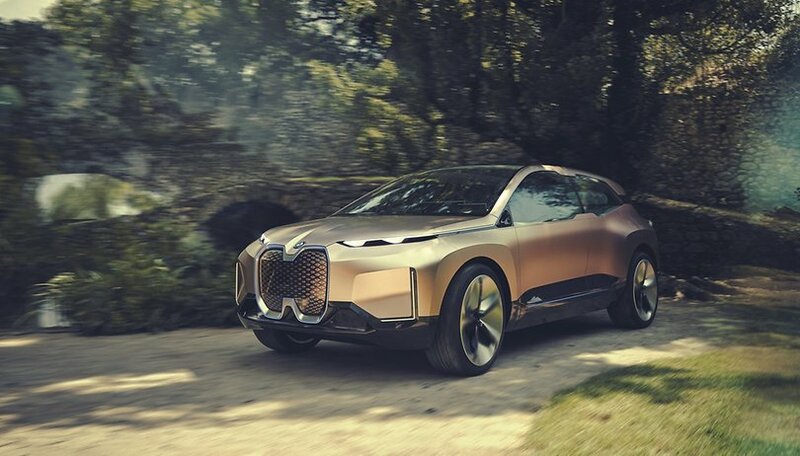 "BMW Vision iNEXT represents a new era dedicated to the pleasure of driving," said Harald Krüger, Chairman of the Board of Directors of BMW AG. The car combines all the key technologies for the future of mobility in the same vehicle. The manufacturer also pointed out that this iNEXT will benefit future models presented by the group's three brands BMW, Mini and Rolls-Royce. And that's good news because the concept looks rather promising. In addition to its undeniably futuristic and elegant SUV look, the iNEXT Vision brings not only a little freshness to the automotive world but also competition for the Tesla Model 3 in the electric station wagons market. While we are still waiting for the production version, which should arrive in 2021, the concept car made my mouth water. Fully automated (just touch the doors to open them) and 100% electric, the iNEXT Vision inaugurates what the automobile of tomorrow will be like. The car was designed with the idea that personal mobility should undergo a significant change, and rightly so. "With this in mind, we have designed the fully electric BMW Vision iNEXT as a mobile environment that improves the quality of life, a new "favorite space" in which we can be ourselves and relax," explains Klaus Fröhlich, member of the BMW AG Board of Directors and head of development. This iNEXT Vision marks a new milestone in this evolution of mobility, showing how smarter vehicles can make our lives easier and more beautiful. Of course, the car is intended to be autonomous (level 5). "There is no real pleasure in driving in traffic jams or on a highway," says Fröhlich. Driving and BMW fans can rest assured that it is still possible to take control of the vehicle manually. He added: "It is important to be able to rely on technologies to improve these moments. [in traffic, editor's note]". "We can also imagine that in the future some cities will only allow autonomous cars to circulate in order to facilitate traffic." The BMW Vision iNEXT will serve as a prototype for the BMW iNEXT, which is scheduled to launch in 2021. By 2025, BMW hopes to launch 25 models, 12 of which will be fully electric. In the meantime, the Bavarian carmaker is expected to launch an electric version of its SUV X3, as seen with the iX3 concept, in 2020. It will then market a sports sedan in 2021, announced via the i Vision Dynamics concept unveiled in Frankfurt last September. With the iNEXT Vision, BMW is moving into a new gear and clearly shows its intention to compete with Tesla. The American manufacturer is going through a difficult period and this new offensive from Germany may only make things worse for Elon Musk. Do you believe the upcoming arrival of autonomous cars is the future? I have to agree with Sorin, I too find the look very unappealing, too many chopped off curves and fiddly bits. The side windows are worse than the notch on a smartphone. My wife thought it looked like a transformer. That said, the technology is still impressive. The appearance is completely stupid and horrible, I hope the pictures are just an uninspired attempt, and I expect to come back with some serious proposals.